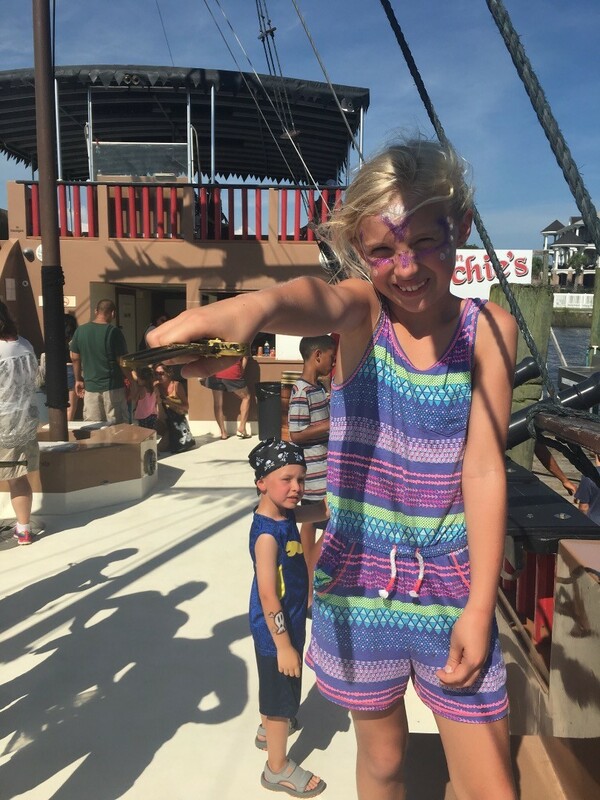 Climb aboard the largest pirate ship in the Carolinas for an engaging adventure your family won’t soon forget. Be on the lookout for unwanted company as you embark on a journey to claim Blackbeard’s infamous treasure. Blast the cannons, ward off the scoundrels, and retrieve the key back from Bad Billy Bones to complete your quest. And that’s only the first part of your voyage! 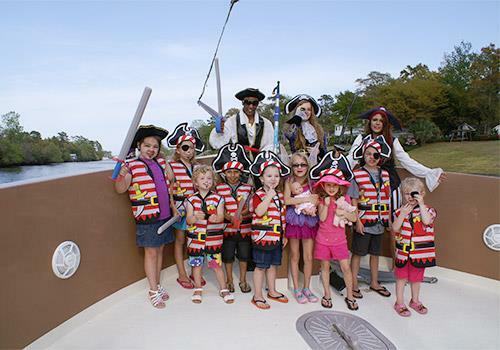 Kids receive a pirate hat, face painting, pirate tattoo, and whatever treasure they find/earn. Features pirate games, dancing, and singing for constant entertainment. Cruises last approximately 60-90 minutes. Don’t forget your camera to capture the swashbuckling memories. Ahoy Matey! 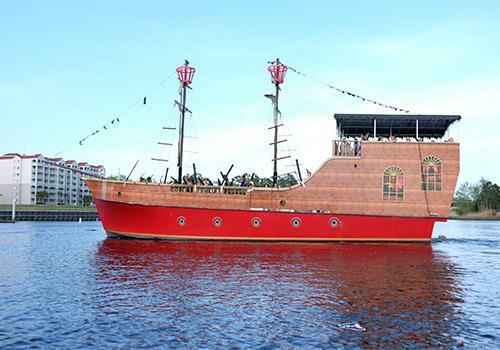 Welcome aboard Blackbeard's Treasure Hunter, the largest pirate ship in the Carolinas! Join us for an interactive adventure your family will never forget it! 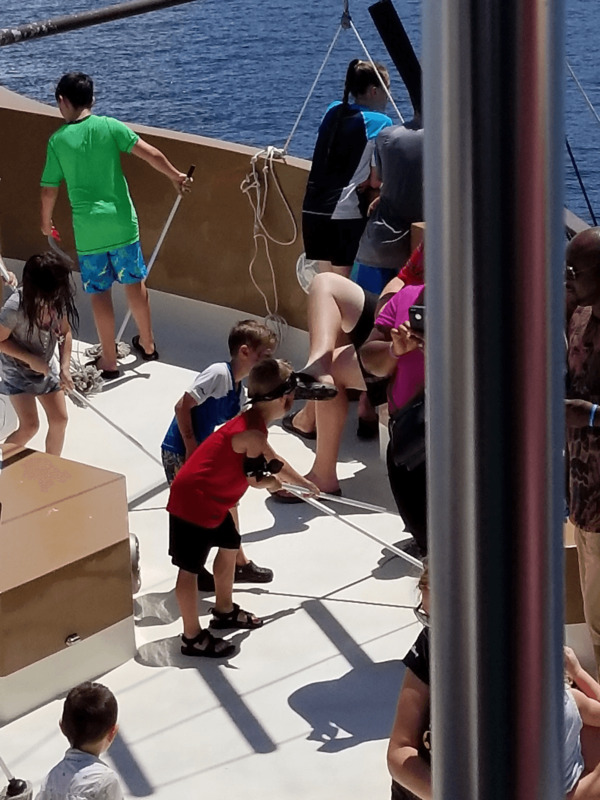 Once under way, we'll begin the hunt for Blackbeard's Treasure, but we may get some unwanted company! The dirty rotten scoundrel Bad Billy Bones has stolen the key to the treasure chest and is hot on our trail. 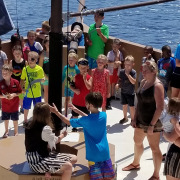 We'll shiver his timbers with our 16 high powered water cannons and capture the treasure! Once we defeat the scallywag, we'll celebrate like true pirates with games, singing & dancing and of course a ceremonial opening of the treasure chest so that all the little buccaneers can go home with some pirate's booty. 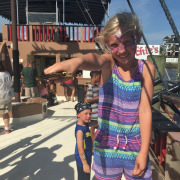 Each little buccaneer will receive a pirate hat, face painting, pirate tattoo and whatever booty they earn! Please note new dock location. Come into North Myrtle Beach on Hwy 17. Take the Cherry Grove Beach exit. At the end of the ramp take a Left. In about 100 yards, take a Left at the Captain Archie’s Sign and drive towards the Waterway. The Pirate Ship is down on the Waterway. 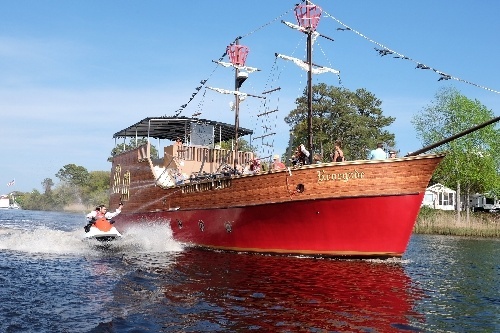 Blackbeard's Pirate Cruise is located at 2200 Little River Neck Road, North Myrtle Beach, SC 29582. Arrive at the ticket office no later than 30 minutes prior to scheduled departure time. Due to limited space on the boat, seats cannot be reserved if you are late. Make sure you allow adequate time for traffic and parking. 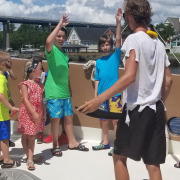 No, our cruise navigates the calm waters of the Intracoastal waterway the same as Blackbeard did during his treasure hunting days. How long is the pirate cruise? 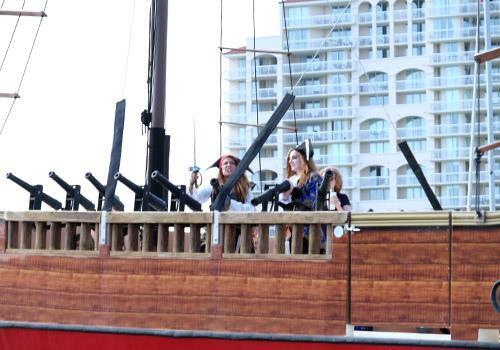 Your pirate adventure will last approximately 60-90 minutes. What is the capacity and what safety equipment is on board? 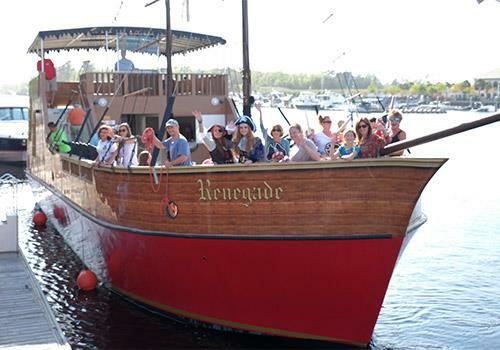 Blackbeard’s Pirate Cruise is coast guard certified to carry a maximum of 75 passengers. There is plenty of seating available. 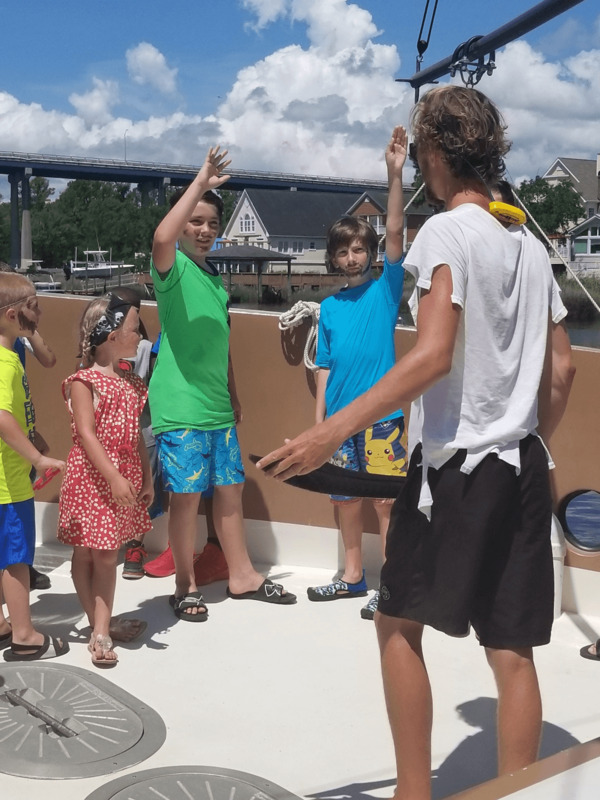 We have safety equipment on board, including radio, life jackets, state of the art electronics, and full compliance of all USCG required equipment. What should I wear or bring on board? We suggest wearing comfortable clothing. You may want to bring sunscreen. Do you sell pirate gear or merchandise? We offer a variety of costume pieces for sale including swords, eye patches, hats, telescopes, t-shirts and authentic Caribbean pirate necklaces. Is alcohol served on board? No, however, you are allowed to bring a small soft side cooler with the beverage of your choice. Please refrain from opening or consuming beverages while not on board. 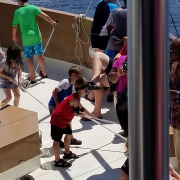 Consuming beverages anywhere other than the boat is strictly prohibited on the property at Barefoot. We sail rain or shine. 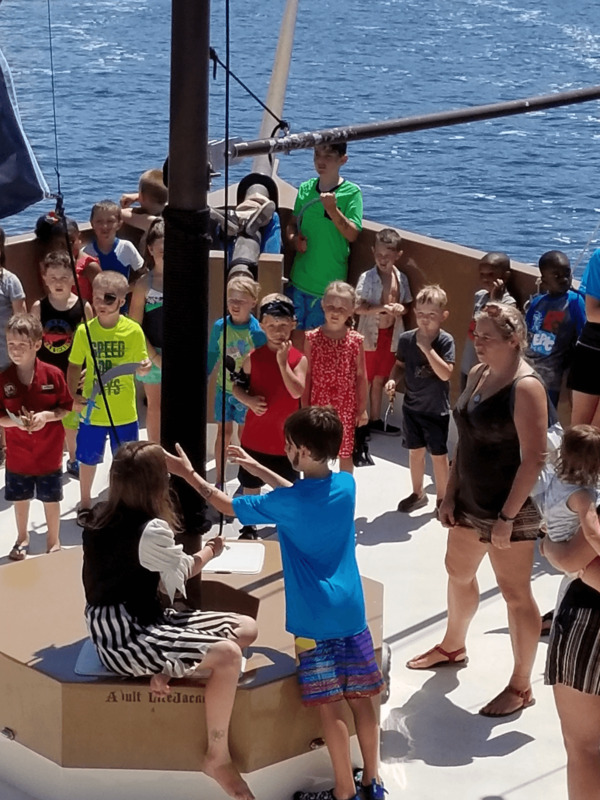 If Blackbeard’s Treasure Hunter must cancel due to inclement weather, you will notified as soon as possible and rescheduled at your convenience or issued a refund. Please ensure you provide us your contact information for the day of your scheduled departure so we may contact you directly. Absolutely. Guests are encouraged to take as many photos and videos as they like.